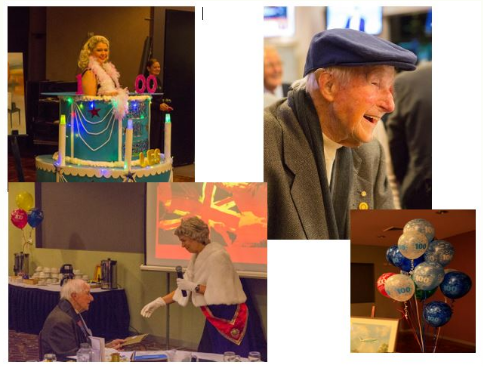 Gosford North Rotarian, Mr Les Arndell, 100, still lives on his own, has his driver’s licence, is very active in Rotary and is really enjoying life after his 100th birthday. In 1788 Captain Arthur Phillip landed in Botany Bay. On board Friendship was Dr Thomas Arndell. Five generations of Arndells later, on June 27, 1916, Mr Les Arndell was born in Armidale. When he was three, tragedy struck as his mother died in a house fi re. Unable to provide for the three children, Mr Arndell’s father placed them in St Joseph Cowper Street Orphanage, on the Clarence River, near Grafton. The orphanage was run by the Sisters of Mercy and Mr Arndell was there until the age of 14. A strong bond was formed between Mr Arndell and the Head Nun, Sister Deppazi. Mr Arndell was put to work on the farm and was educated in the convent school. Before her death, Mr Arndell’s mother had saved 100 pounds for her three children. The nuns invested the money, and by the time Les left the orphanage his share of 33 pounds 6 shillings and 8 pence had compounded to 50 pounds. The three children moved back with their father, who had re-married. For various reasons, this arrangement did not work out and Mr Arndell and his brother moved into a boarding house. Mr Arndell worked with his father for “five bob a week” and became a competent motor mechanic. In 1929 the Depression had hit and his father “went broke”, as did another garage Mr Arndell worked for. Mr Arndell used the fi fty pounds to purchase a seven-seater Dodge with two dickie seats. As well as running a delivery service for outlying farms, he drove the police around the country side. They relied on horseback and had no qualms about giving the lad a licence. Mr Arndell also cleaned pig trucks for threepence a truck. The Second World War followed the Depression. Working for the Civil Construction Board, Mr Arndell went to Darwin and used his motor mechanic skills to maintain army trucks. While still in Casino, Mr Arndell married. Mr Arndell and wife Ivy had a son, Barry James. Their happiness was short-lived and tragedy again struck in Mr Arndell’s life. Barry only lived for three months. The couple lived in Sydney, working for the Department of the Interior. Mr Arndell drove trucks and helped build an underground munitions storage at St Marys. He also worked for the Ford Company at Lidcombe, making bren-gun carriers. The Arndell’s moved to the Central Coast, for his fi rst job working for the Red Bus Company as a mechanic and conducting tours. He borrowed 500 pounds from the bank and started Midway Motors, having a dealership for Land Rovers. Midway Motors became a very successful business on the site of the current former Mitsubishi dealership at North Gosford. Mr Arndell was able to indulge in other pursuits. He was a very good golfer, was the Captain of Gosford Golf Club and is now their Patron. Mr Arndell learned to fl y, owning a Piper Cherokee, and once a year he fl ew to Coffs Harbour to play golf with his partner, the legendary Kel Nagle. In 1972 a new and very important part in the life of Mr Arndell was about to begin. Mr Arndell was approached to become the first President of a new Rotary Club about to be formed, Gosford North. With no knowledge of what Rotary was, he declined, but did become the second President. He is one of three Charter members still in the Club. The number of successful projects during his Presidency were remarkable. Les held many Board positions in Rotary, but it was in the International fi eld where he excelled, being the District International Chairman for several years. He twice visited New Guinea on Rotary projects. Mr Arndell also often fl ew District Governors to many parts of the country. He is a Paul Harris Fellow and remains very active and generous with his advice in Rotary matters. Mr Arndell is now one hundred and shows no signs of slowing down, attending Rotary nearly every week. Few Rotarians achieve 100 per cent attendance and his club believe he has achieved this by averaging participation in a Rotary project every week over the past year. Mr Arndell still lives alone, having lost his wife years ago. He has a very strong support base of friends who love him for his positive attitude and the ability to make them all feel special. This was clearly proven by the attendance of over 250 people at two functions to celebrate his hundredth birthday.